Halloween is still a month away but ever since we found this project on Pinterest, we wanted to try it. And since the spooky holiday is now officially only 30 days away – here it is. You need an artificial tea light (we got 6 for $2.50 at Walmart), some Ping-Pong/soft golf balls, a knife and some sharpies. It is super easy. Just cut a little X on the ball and put it onto the tea light. Then let your kids decorate it as they want to. Sharpies work best. 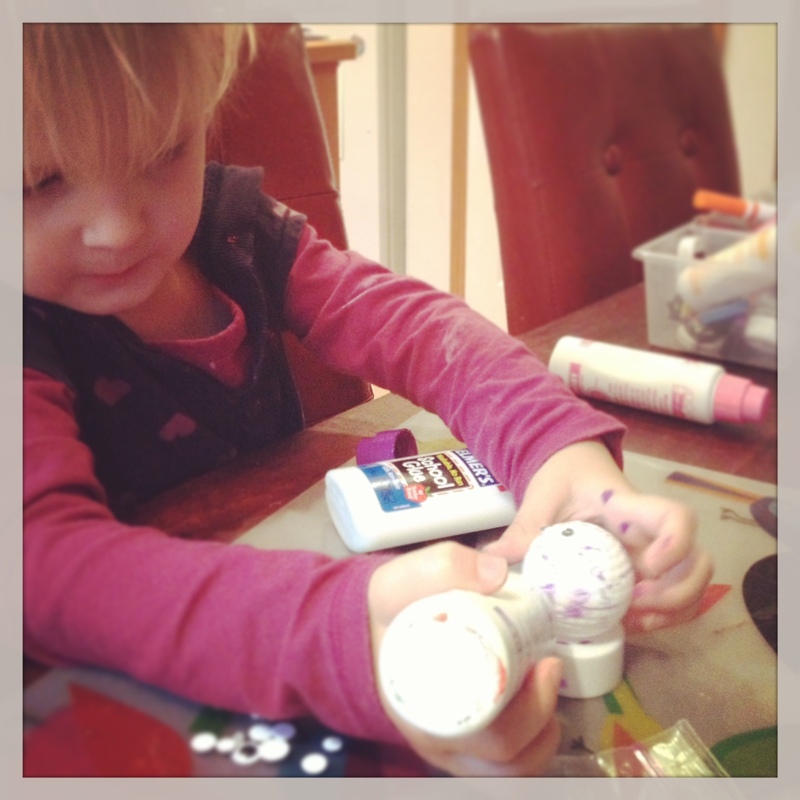 We also used some googly eyes with glue to make the monsters super scary. 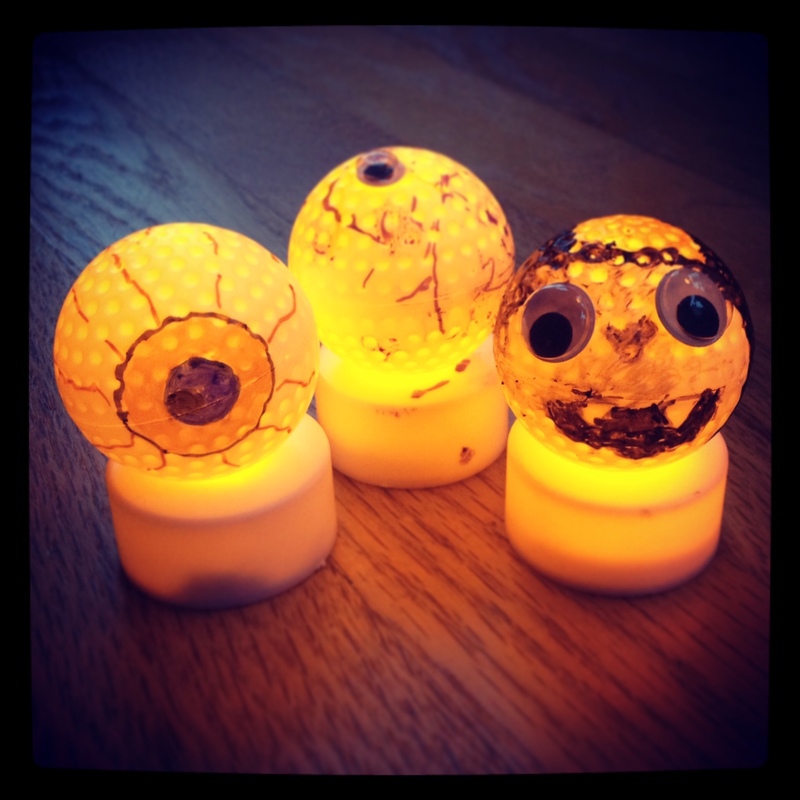 My kids LOVED the project and took their creations to their rooms as night lights. The battery will probably not last that long… but luckily we have a lot of extras and the balls are easily exchangeable. Fall is here! It is getting windy, cold and rainy. 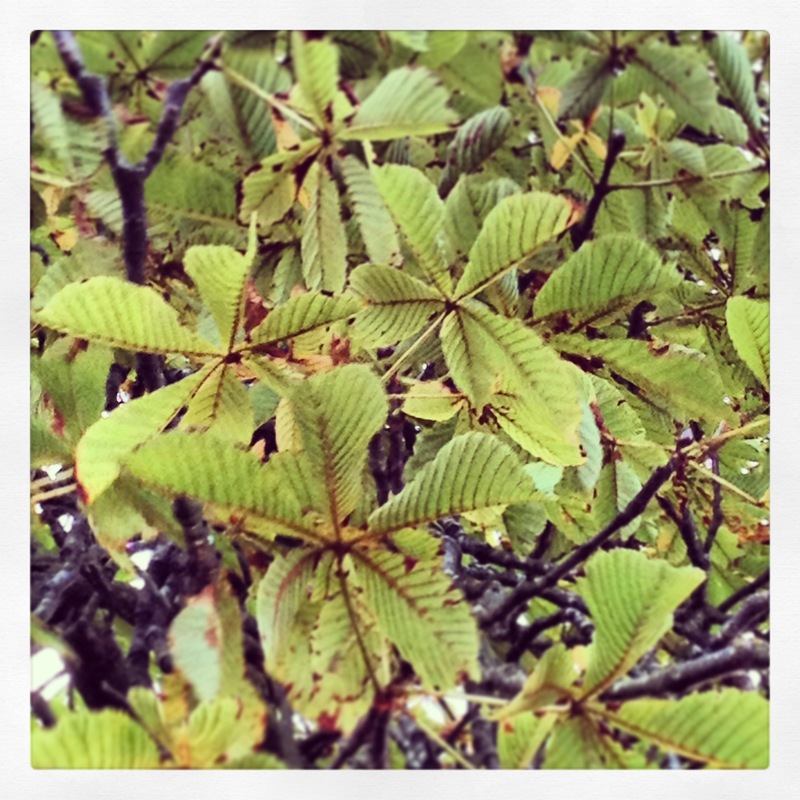 Leaves are changing colors and chestnuts are falling to the ground. 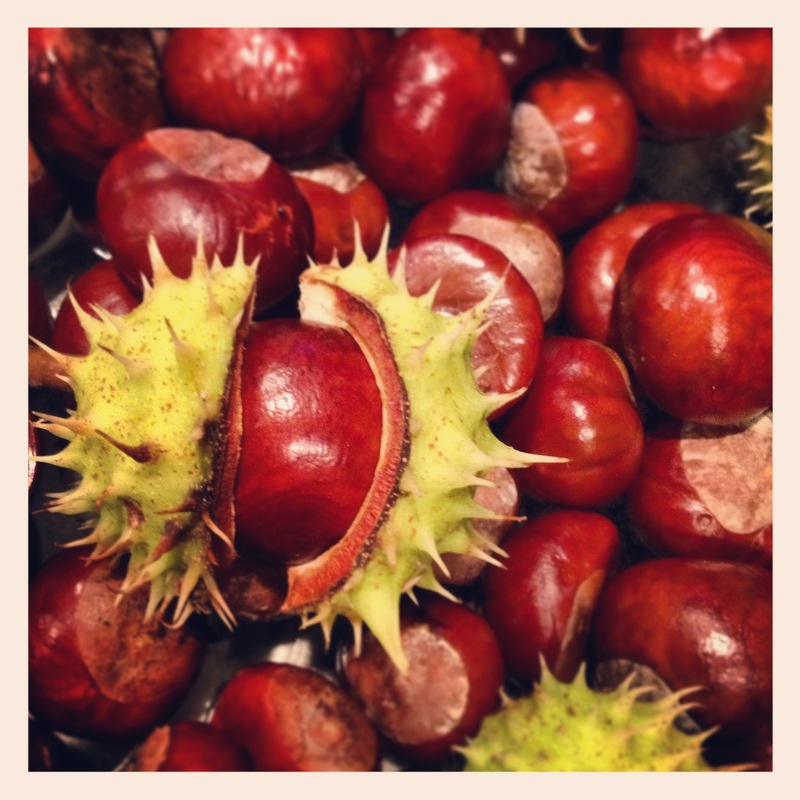 Yesterday on our walk home, we came over an amazing chestnut tree. It was huge and in a place where nobody walks so there were so many chestnuts, we could not pick all of them up even if we tried. 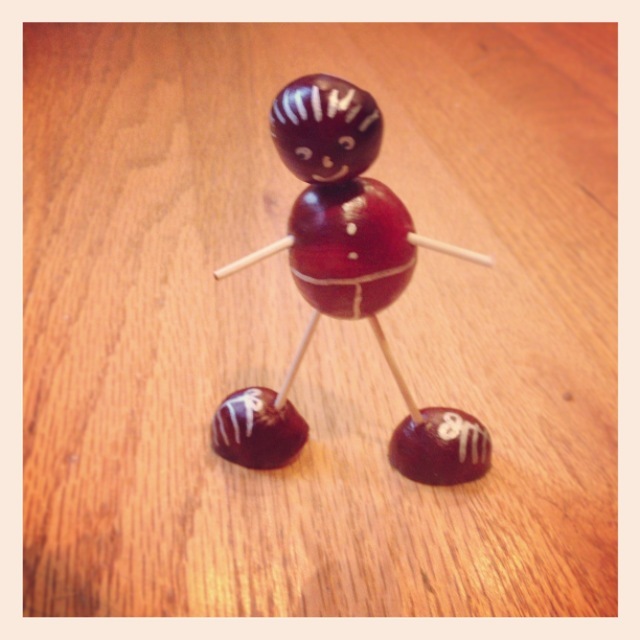 Today as soon as my kids came home from school we started working on them. 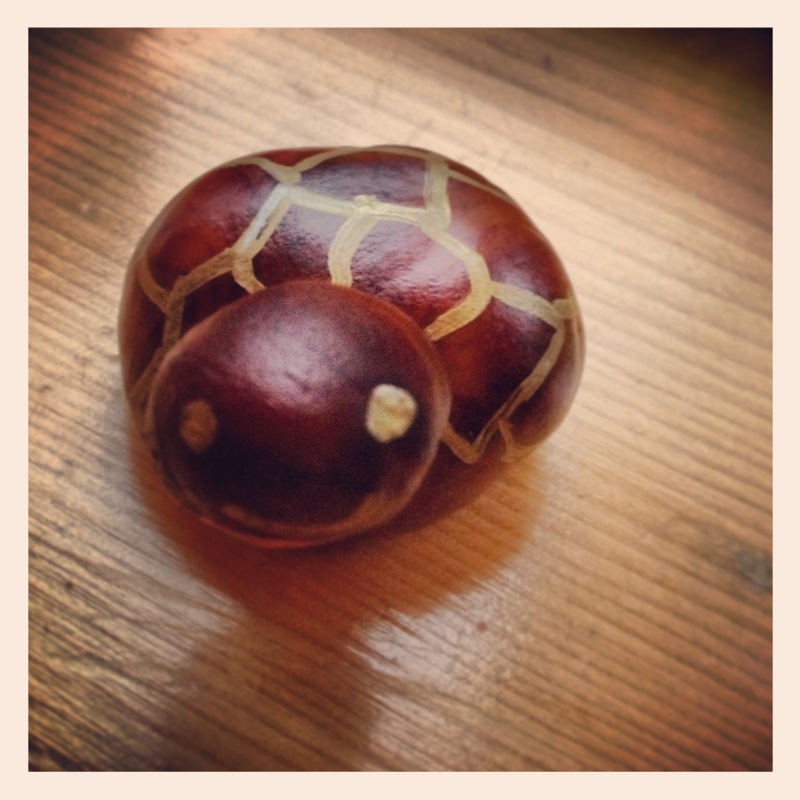 Chestnut animals are our family tradition. We do them every year. This time, we created a caterpillar, a snowman (my kids cannot wait for Christmas), a guy, a turtle and a cat. 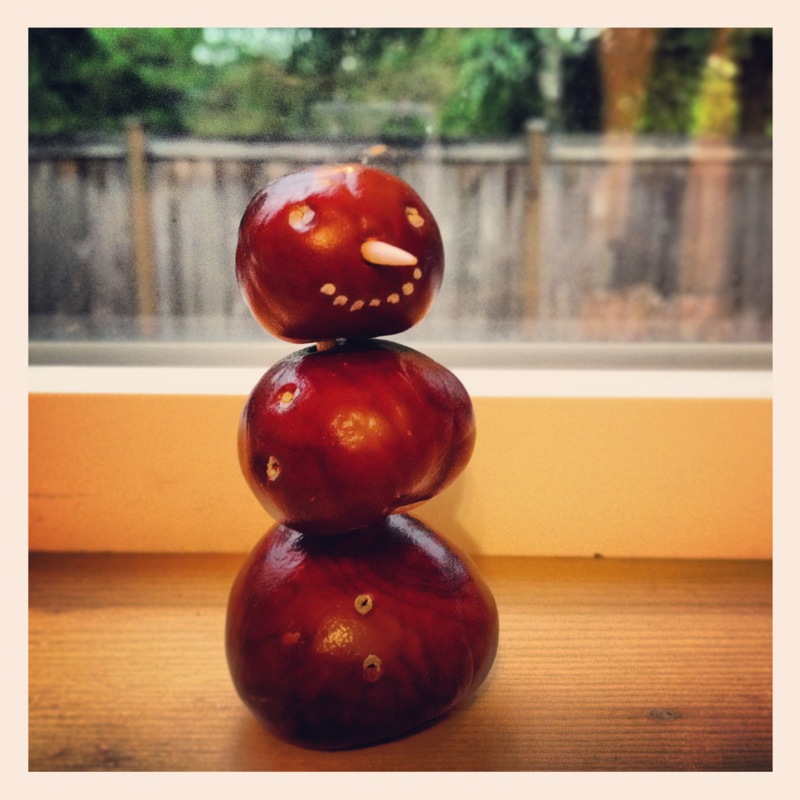 We used a big needle to make it easier for the toothpicks to get into the chestnuts. We also played around with gold and silver sharpies – and found out they look pretty amazing on the dark brown nut! Now we cannot wait for the leaves to come crumbling down. What can I say, we love this season! 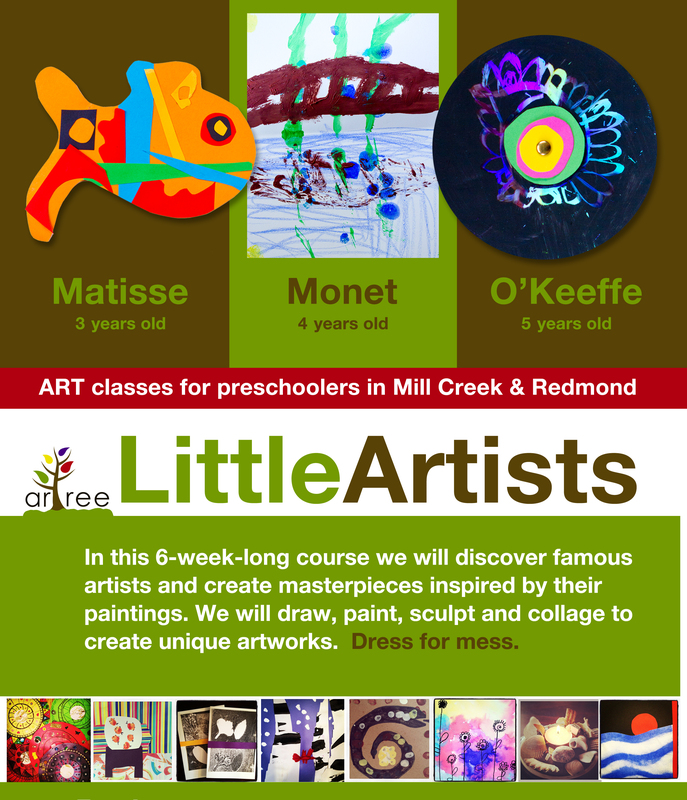 You can win a year-long subscription to arTree magazine (digital art magazine for kids)! It is very easy. Just try to guess how long did this 150-layer laser-cut-paper window take to create. The closest guess will receive the prize! You can leave your comments here on our Facebook page and we will select a winner Tomorrow (9/19) at noon! Good luck! This course is now taught at Woodside Elementary school in Mill Creek, WA – and since the Monday session is already full, we will probably be adding Tuesday one as well. You can register thought the parks and recreations: Redmond and Mill Creek. 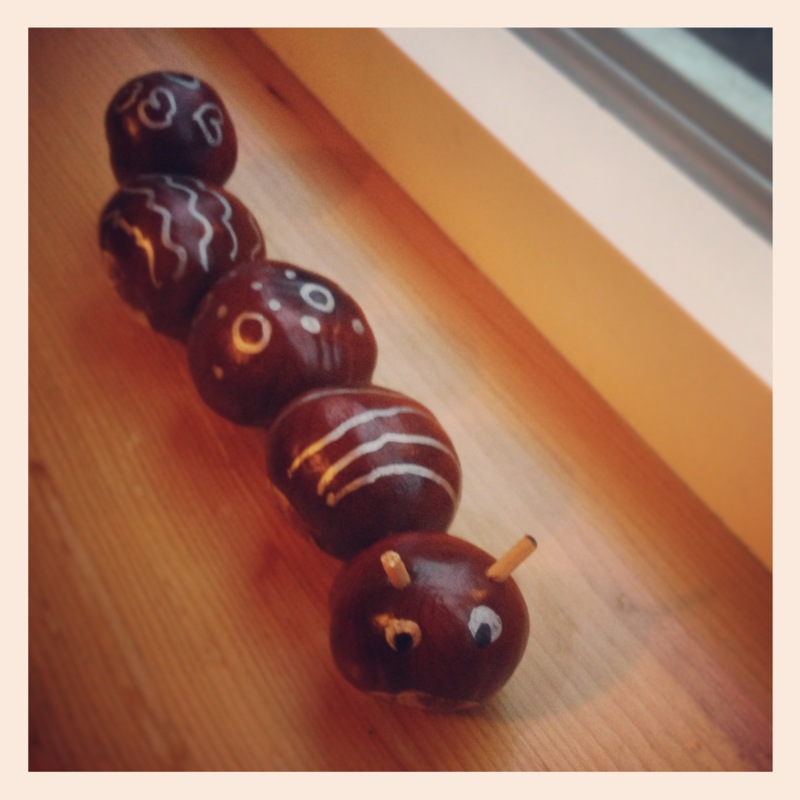 We will also be offering Halloween and Christmas Saturday workshops for kids, so stay tuned! And if you’d like to see other classes, let us know! First Issue of the arTree magazine is here! Do you want to learn about architecture? In this issue of the magazine, you can design your own dream house, learn to talk like an architect and build a house out of a bottle. You find out why Hundertwasser loved windows so much and how Eric Standley cuts them out of paper with lasers. You will design (literally) sweet towers and play cities in your room. And that is just beginning! Have you subscribed yet? Click here to learn more. Don’t forget – once you create something, share it with us. 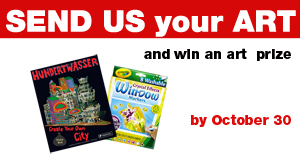 If you send us Hundertwasser-inspired artwork by October 30th, you will have a chance to win an art prize! 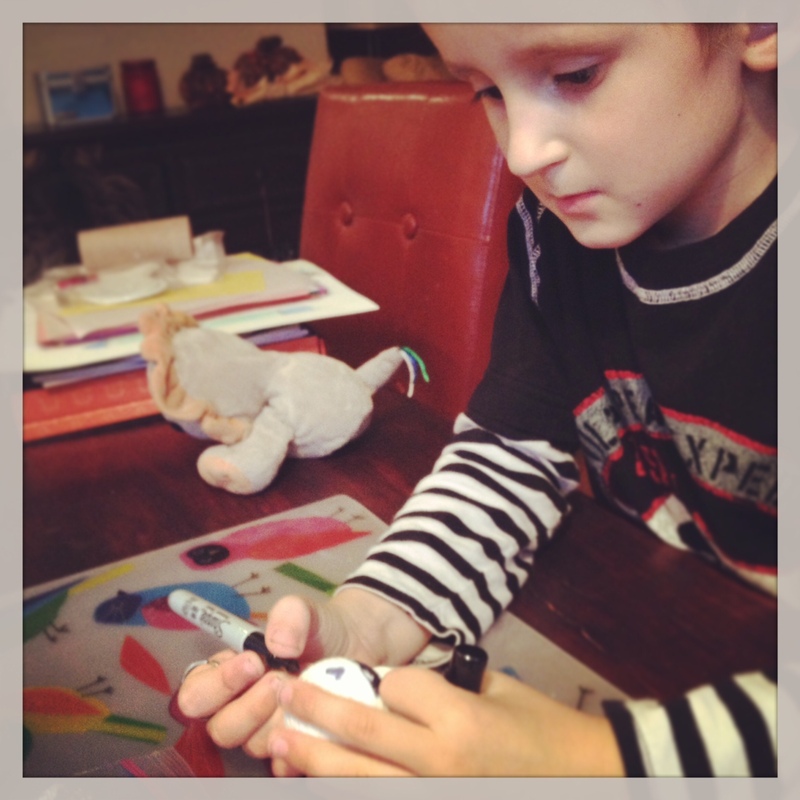 This month it is an amazing Hundertwasser’s sticker book and markers for your window! 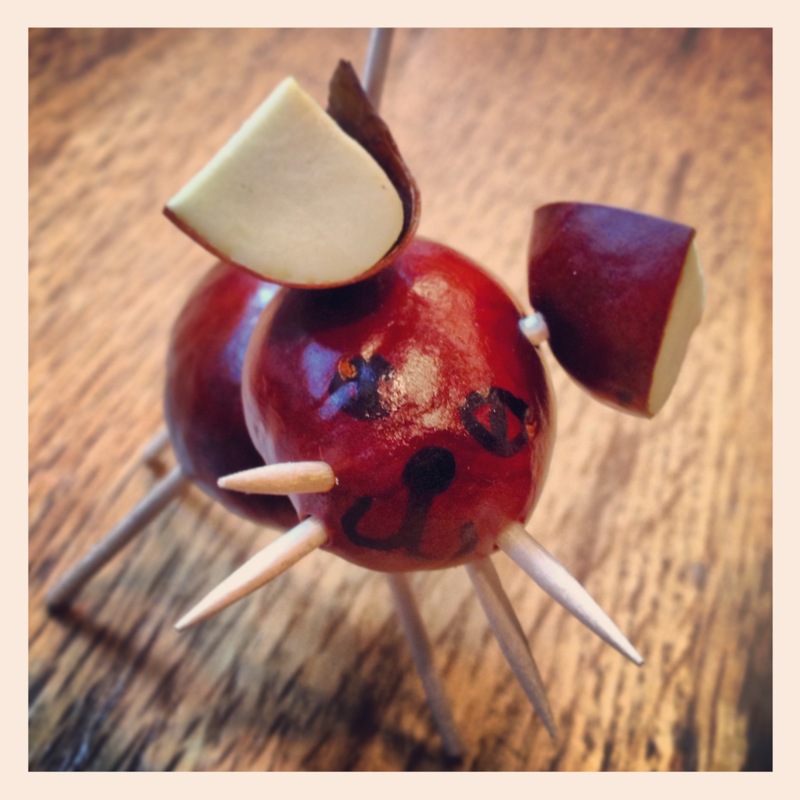 Send us your pictures at art@arTreeKids.com. My kids always love to go to the zoo, especially since we found one that has sharks! My son usually sits in front of the glass and watches them swim for a long time… and then he draws them at home. 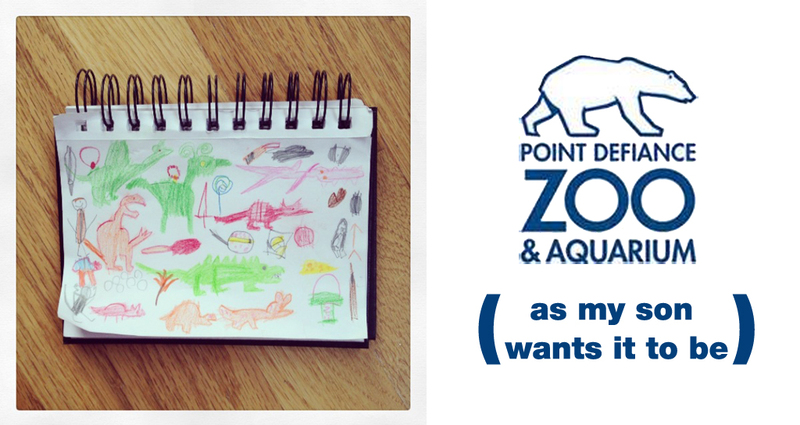 Ever since he was three, he was obsessed with ocean creatures (especially these). 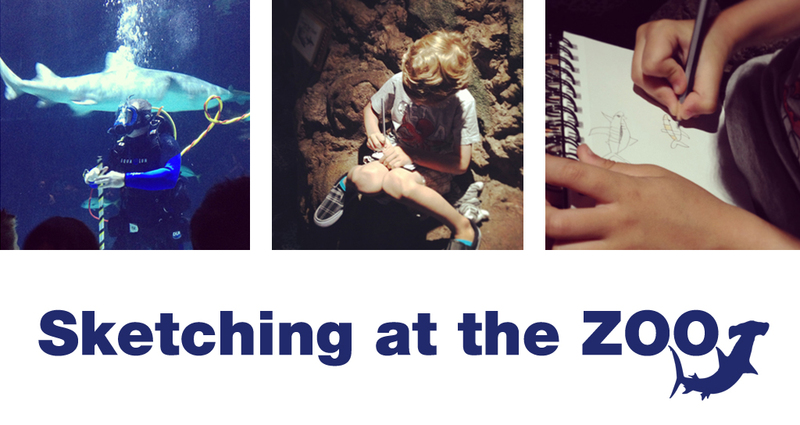 This time, we took some pencils and papers with us–to try to sketch the animals as we were observing them. It was quite fun (and challenge). The sharks kept swimming wherever they wanted and it was difficult for him to keep up with them. But he figured it out pretty soon. We observed them together and talked about what we see–shape and number of fins, shape of the tail, size, etc. He loved it. Then we went outside to look at other animals and drew more of them (camels, armadillo, sting ray, fox)… and then it got out of control. He decided that the best thing would be to fill the remaining space with other things we saw (like bubbles and ice cream) and of course, animals he would love to see here as well–from mountain goats to shooting dinosaurs. After all, he’s five.